At first glance, romance seems an improbable angle from which to write a cultural history of the German Democratic Republic. By most accounts the GDR was among the most dour and disciplined of socialist states, so devoted to the rigors of Stalinist aesthetics that the notion of an East German romantic comedy was more likely to generate punch lines than lines at the box office. 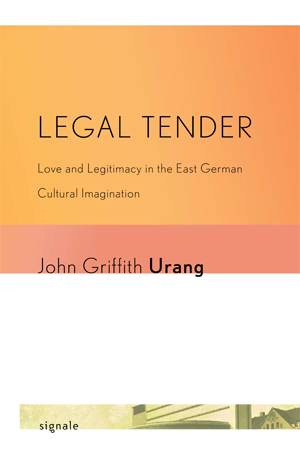 But in fact, as John Urang shows in Legal Tender, love was freighted as a privileged site for the negotiation and reorganization of a surprising array of issues in East German public culture between 1949 and 1989. Through close readings of a diverse selection of films and novels from the former GDR, Urang offers an eye-opening account of the ideological stakes of love stories in East German culture. Throughout its forty-year existence the East German state was plagued with an ongoing problem of legitimacy. Urang shows how love stories helped mediate discrepancies between the ideals and the reality of East German socialism, lending provisional legitimacy to the Party's claims and promises. In the face of growing social stratification, love provided a language with which to discuss class antagonism without undermining the egalitarian ideals of the Workers' and Peasants' State. But for the Party there was danger in borrowing legitimacy from the romantic plot: the love story's destabilizing influences of desire and drive could just as easily disrupt as reconcile. A unique contribution to German studies, Legal Tender offers remarkable insights into the uses and capacities of romance in modern Western culture. John Urang is an Assistant Professor of Media and Film Studies at Marylhurst University.